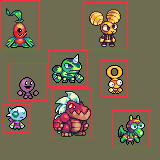 A set of minor characters, with their standing animations, from our commercial but open-source game Frogatto & Friends. In need of some nice town greeters, shopkeepers or regular gossipy townsfolk? These characters are up to the task. Cool to see some of Frogatto's art here :) Can't wait to play the next version of the game! These characters were used for the Alien Universe! Hey I'm commenting again just to let let you know that the game is online now and these beautiful monsters are the heart of the game! It's an Online RPG about catching Monsters & collecting Vocabulary cards. I added your name & url to the Credits.